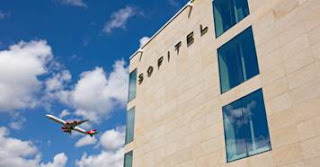 Business Travellers – who sometimes see more of the interior of airport hotels than the destinations they visit - have named the Sofitel London Heathrow the "Best Airport Hotel in the World" for 2009. The accolade was awarded as part of the recent USA Business Traveler Magazine Hotel Awards 2009. "The Sofitel London Heathrow is not an airport hotel, it's a five star luxury hotel which just happens to be at an airport," explains Surinder Arora, chairman of Arora International Hotels, owners of the Sofitel. The five-star, 605-bedroom Sofitel London Heathrow is one of the world's largest, luxury airport, meetings and events venues, linked to London Heathrow's Terminal 5 (T5) by a bridge. Just 21 minutes from central London via the Heathrow Express it also offers the largest onsite, undercover parking facilities in the area. The hotel's Concept Architect is Stephen Williams, who previously designed the Conrad Hotel in Chelsea Harbour, while the hotel's glamorous interiors have been designed by KCA International's Khuan Chew, who is renowned for her work on the Burj Al Arab in Dubai. Khuan Chew has focused on the concept of a 'gateway to the world' as her design inspiration and themes of country and continent resonate throughout the hotel. 'Antarctica', for example, takes centre stage in the entrance lobby with a dramatic water fountain centrepiece commissioned from RHS Chelsea winner, David Harber. Among Chew's touches in the hotel's fabulous 165m2 Imperial Suite are the first Swarovski crystal bathrooms featured in a European hotel. The Sofitel features a wide range of food and beverage options. Chef Consultant Albert Roux oversees the hotel's fine dining restaurant, Brasserie Roux, and brings a touch of fabled French gastronomy to Heathrow. The Sofitel also houses Tea 5, an exquisite tea salon complete with its own Tea Master and signature delicacies. The hotel's Icelandic blue Sphere Bar is a vibrant and informal meeting place, while the more intimate Library Bar serves up signature cocktails taken from London's hippest bars. Sofitel London Heathrow introduces the UK to its first experience of 'couture meetings' facilities. The hotel contains 45 individually designed meeting rooms (with a maximum capacity of 1700 in the 1309m2 Arora Suite) along with a tiered theatre seating 117, and three high-tech boardrooms (with a choice of a private dining room or a Chef's table in Brasserie Roux). Exhaustively equipped with the latest in technology of the highest standard, the hotel boasts Sofitel's trademark world class service. 'Couture meetings' also includes the newest conference dining experience in 'Vivre - l'expérience des saveurs'. This initiative allows the event's pace and style to be matched with the theatrical sensation of 15 cooking styles. 'The Spa at Sofitel London Heathrow' provides a luxurious sanctuary for soothing relaxation and natural treatments using ESPA products. Spa wellness programmes include a specially formulated 'Bodyclock' programme. Sofitel creates unique luxury hotels in the world's most attractive destinations, by the artful blending of its French origins with the very best of local cultures. Sofitel forges a privileged bond between its staff of devoted service professionals and its cosmopolitan guests who expect and appreciate beauty, quality and excellence. Sofitel offers the best of French elegance, from food and wine rituals to bedding, design and personal care products. Hotels where life can be savoured, shared with others, lived in harmony with oneself; transforming every stay into a unique and unforgettable experience.